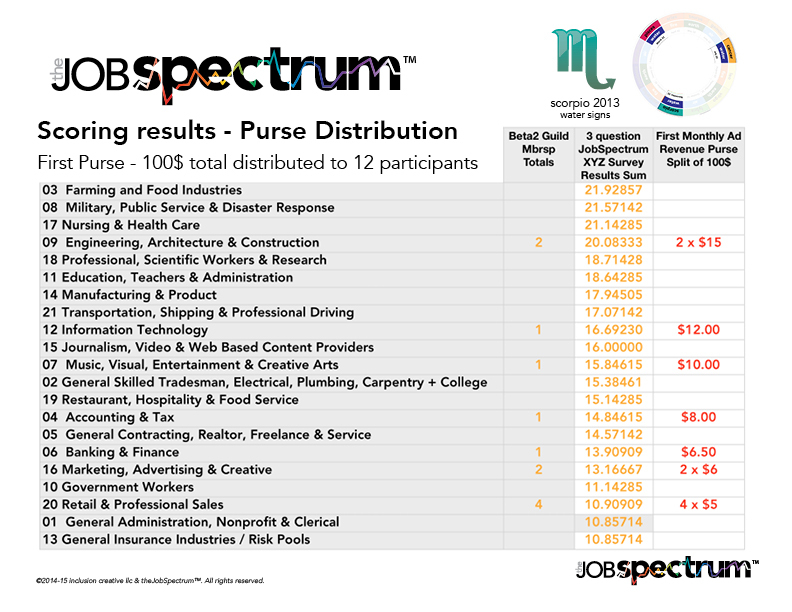 This 4 Month, complete cycle JobSpectrum Beta2 Survey sample demonstrates how the data is collected and scored. Because there is no Advert Revenue to divide, we had to use just hypothetical totals for distribution to the different Guilds and their members. For the first month distribution (which the Guild members would receive 60+ days after their designated time allotment would close) we divided 100$ among the Participants, 100$ again for the Sagittarius designation, 200$ for the Capricorn, and 300$ for the Aquarius. 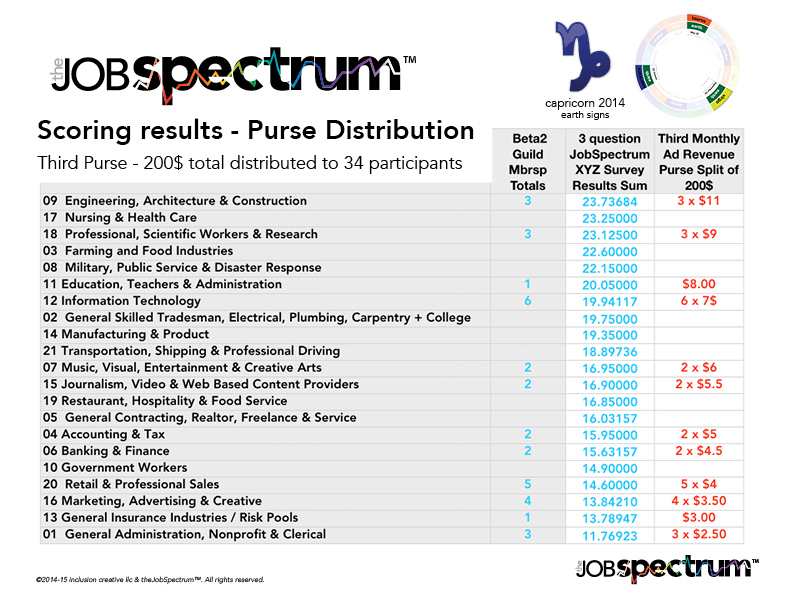 As the different months progress, you can see more and more Participants get folded into the flow of the statistics. 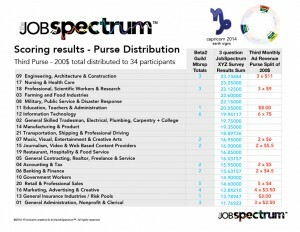 One thing to remember – because this is a ‘Shared Labor’ endeavor, Participants get paid 12 times a year, but only Participate in the Survey 3 times during the course of the year. 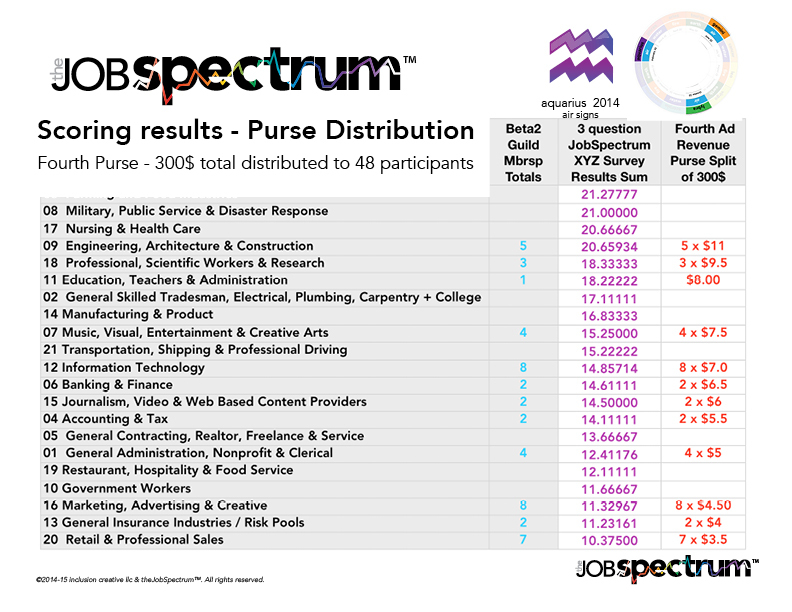 This is one of the core constituencies of the functionality and benefits of how this works. Make sure you click on the pictures within this page so you can see the details of how the 3 question survey adds up to the totals displayed and accumulates the Ranking scores. 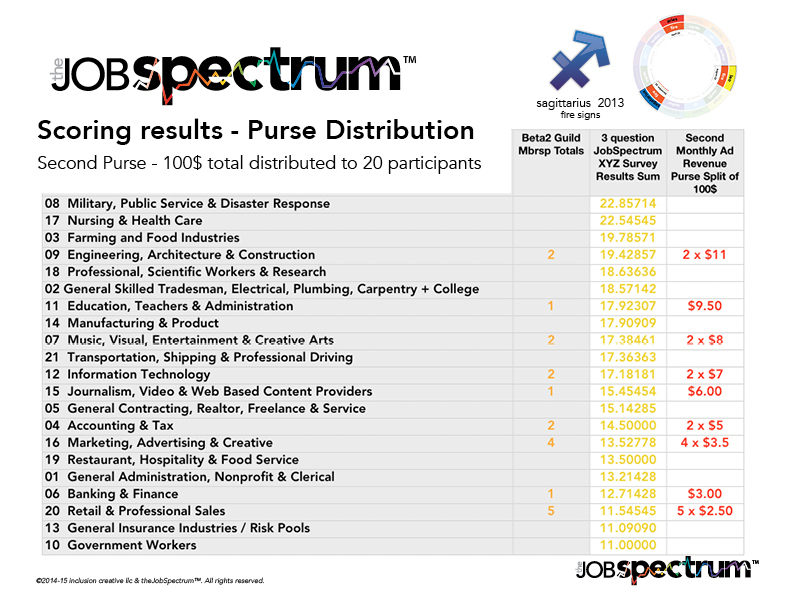 As you can see, by the Aquarius segment, All Participants are receiving compensation by the 4th month… hence the “Shared Labor” aspect of theJobSpectrum™ philosophy and mechanism design. The way the monthly ‘Purse’ is divided centers upon the philosophy of a fair split of the funds along the lines of the irrational number Phi. This is too much to explain in depth at this time – we approach this from a position of Art instead of a direction of Mathematics. It’s a fair distribution of the purse along the lines of how a golf tournament distributes its purse to the individual golfers, that adheres to the curve of Phi and area. As the number of Participants increase, we will keep the difference between the first place Guild share and the last as a ratio that is ruled by Fibonacci sequence – for this Beta test the Ratio was around the thirteen over eight range.